These Keto Cheese & Bacon Rolls are delicious and won't throw you out of Ketosis! 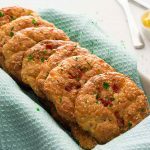 Straight from the oven, or warmed in the toaster, you’ll be making these keto bread rolls over and over. The SECRET is the 3 Cheese Ingredients! Saute diced bacon in a frying pan over medium heat, until just starting to brown. Turn off the heat. Add the cream cheese to the bacon and allow to soften while the bacon cools for 5 minutes. In your food processor, place the bacon and cream cheese mixture, along with all remaining ingredients. Keep a spoonful of the bacon aside to top the rolls. Blend on medium speed for 3-5 minutes until all ingredients are well combined. Spoon the mixture into 12 even piles on lined baking dishes. Sprinkle the reserved bacon on each roll. Bake for 13-16 minutes, until the rolls are golden and puffed up. Enjoy them hot from the oven or store in the fridge. They can be quickly reheated in a microwave or toaster oven.